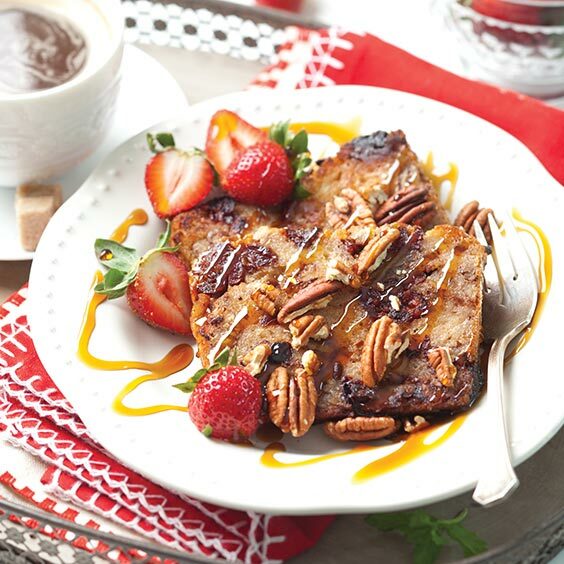 Breakfast doesn’t get more decadent than this Pecan Bread Pudding French Toast. In a large bowl, combine melted butter, cream, eggs, sugar, pecan, cinnamon, bread, and cherries. Pour into a lightly greased 9x5-inch loaf pan, pressing lightly to fit into pan. Cover and refrigerate overnight. Let pan stand at room temperature 30 minutes. Preheat oven to 375°. Bake until light golden and center is set, 40 to 45 minutes. 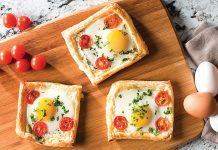 Let cool in pan 30 minutes. Remove from pan, and slice. 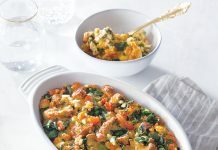 In a large skillet, melt 2 tablespoons butter; add bread slices, and cook 1 to 2 minutes per side. Add more butter, as needed, and cook remaining slices. Serve with cane syrup, toasted pecans, and fresh strawberries, if desired.